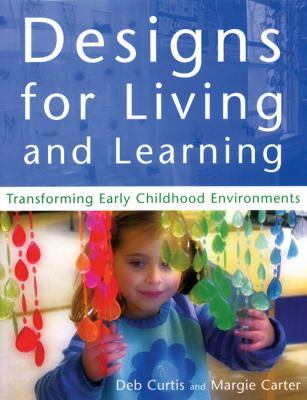 For many years now I have been greatly inspired by the Reggio Emilia approach to early childhood education and have sought any source of information that I could get my hands on! 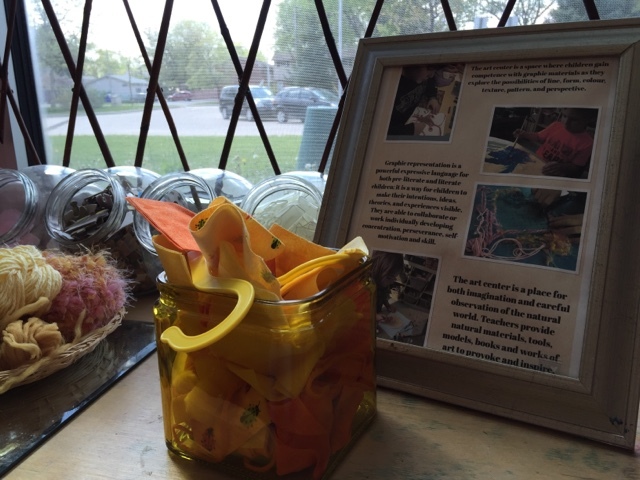 When FDK was first introduced in Ontario I was thrilled to see that many of Reggio's beliefs were interwoven in the document and honouring children's interests through play, inquiry and documentation were highlighted. As educators who follow a standardized curriculum we have great flexibility in our interpretation and implementation of the expectations and this makes our role exciting and dynamic. 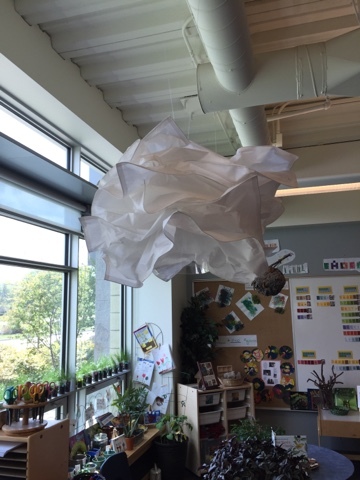 I believe in having a fluid, evolved space that continues to change to better reflect the needs of the children and support heightened understandings of explorations and inquiries as well as enhanced abilities in the various domains of learning. 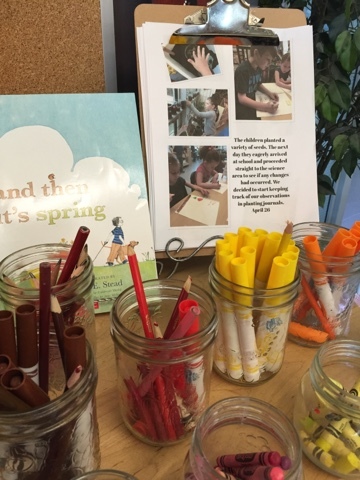 We want to support the whole child in developmentally appropriate experiences and integrate learning materials from centres in diverse and unconventional ways. There are three texts especially that have guided my work and helped us with our vision as we have continued to evolve our classroom environment together with the children. We want our space to be multi-faceted; we want it to be a studio and laboratory where the children can immerse themselves in explorations and wonder; we want visitors to be able to connect and understand the stories of what the children have done in the past and how the learning has moved forward; we want our families and greater community to be reflected in our space; and we want to feel inspired as educators who are on a journey together with the children. As we come to the end of another wonderful school year, I felt it was important for us to share our classroom with others. 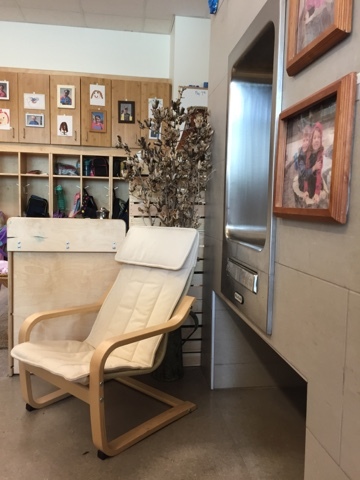 We have many families and visitors who have observed the metamorphosis of the space over the last 9 months and I think it's important that the theory and reflection on how each space came to be is clearly communicated to others. I have tried to do this in two ways. I have recorded a tour of our room in the following video. This was my first attempt at doing anything like this and it was an interesting experience for me because I had to really reflect upon each space and think about how to best communicate the richness of learning and history of how it came to be in a clear and concise way (and to be honest I was a little nervous doing so in a video format). 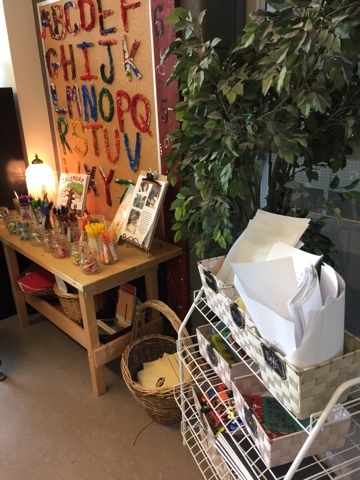 I have also included some photos of the space with written thoughts to share how the children have used the areas and show how every corner in our room, regardless how small, has intention and purpose as connected to the interests, strengths and needs of the children. 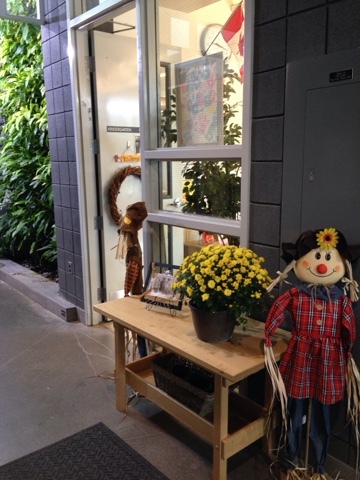 This is the door leading to our classroom. We are fortunate to have a living wall just outside our room which captivates many visitors. 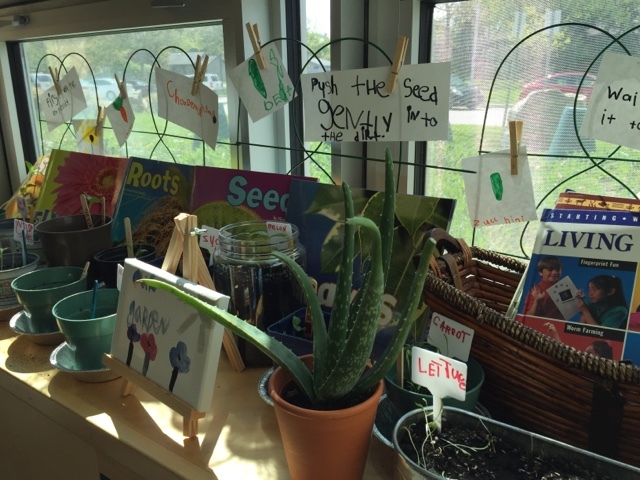 The children love seeing the plants grow over time, watching the plants being trimmed, and catching the many living creatures who share the space including ants, spiders and slugs. 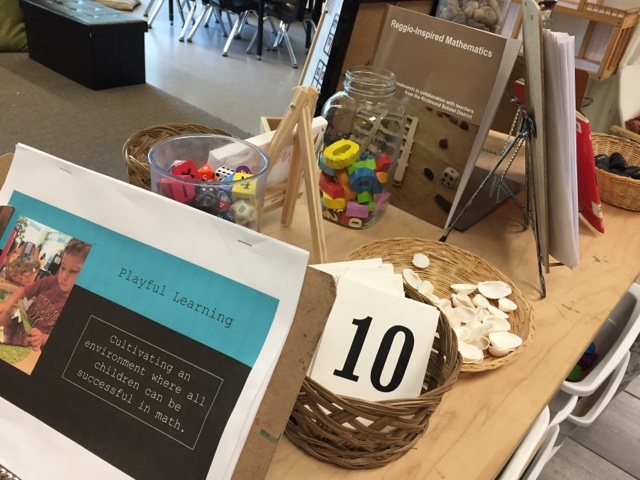 Building relationships with families and helping them learn about and support growth mindset is a big part of creating a safe and supportive space for rich mathematical thinking. Something about which I've had a lot of positive feedback is our 'wish wreath'. Each September we ask families to write their hopes, wishes, dreams, etc. for their children's kindergarten experiences on paper ribbons. We weave each of these onto a grapevine wreath and display it on our door. We want it to be a symbol of our partnership and collaboration with families for the year ahead. 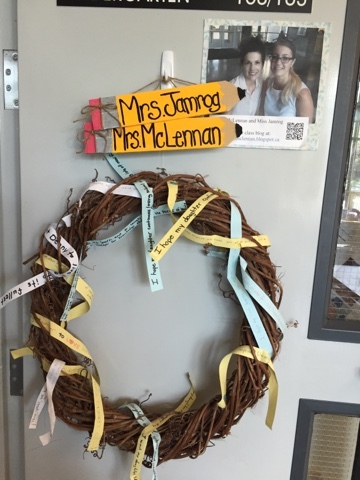 We also include a photo of our teaching team and visitors to the room can access our class blog by scanning the QR code on the door. 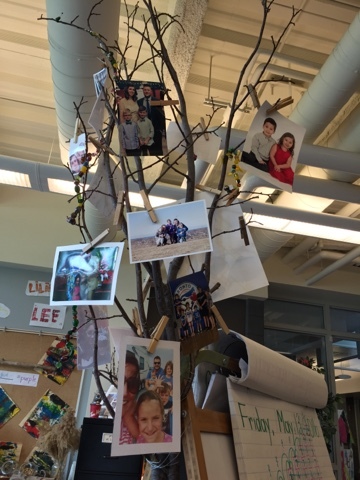 Our families are also represented on the 'living tree' located in the centre of our room, next to our large carpet. 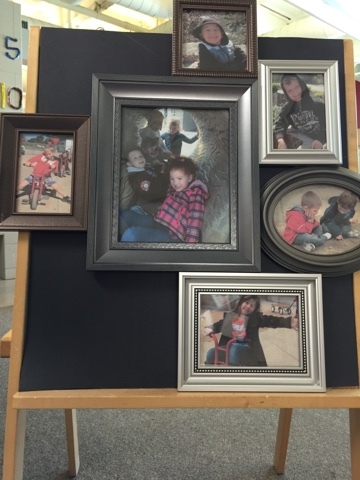 We request family photos at the beginning of the year and these are displayed together. 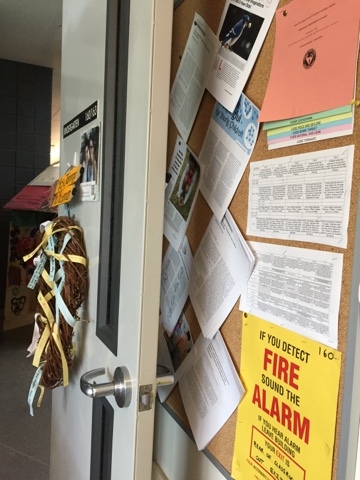 I believe in showcasing the professional development and work I have done outside of the classroom and keep copies of important professional endeavours (published articles, yearly plans, copies of presentations, OT information) just behind the door so it's visible and can be accessed by anyone who visits the room. 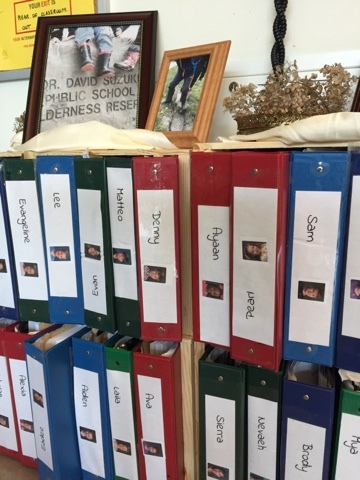 Each child has a special binder that acts as a portfolio of their explorations and achievements throughout the year. These are visible and accessible to families and many children like to look through their collection of artifacts during the day. This encourages metacognition and reflection as the children review their learning and share it with others. 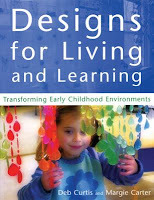 We also find it can spark future work as children revisit and enhance their ideas in new ways. 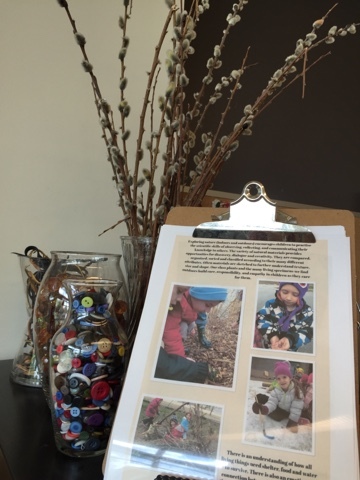 These are also sent home on a regular basis and we include a reflection page for families to use as a guide when reviewing the artifacts with their children. These are returned to school and included in the binder. Although children self select pieces to be included, we also insert any evidence that we feel helps share the story of the child's experiences throughout the year including annotated photos, written observations, drawing and writing samples, checklists, interviews with the child and many more pieces. 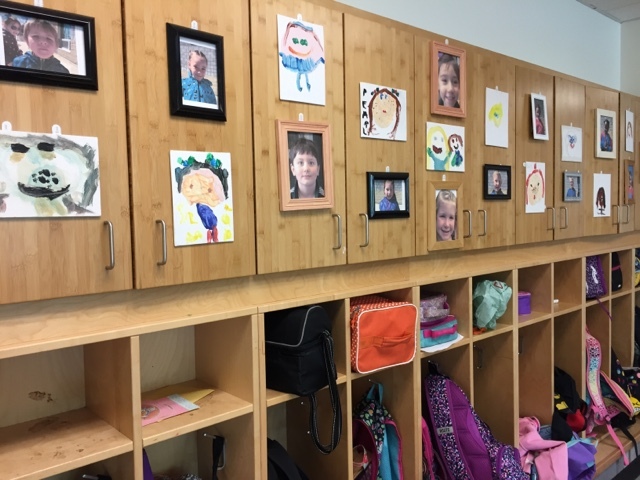 Above each child's cubby is a recent photo and painted self-portrait. These change a few times each year (usually a new photo and self-portrait per term) to help show their growth. 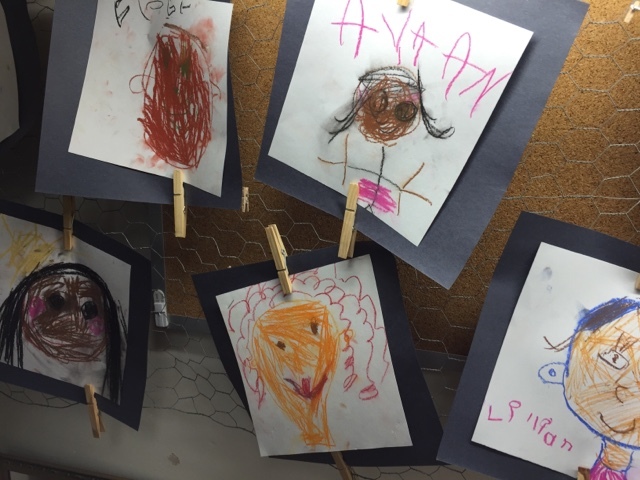 We like including a real photo to celebrate each child (and we love using eclectic frames to decorate the space) and love how the children use the language of art to represent their perception of self. 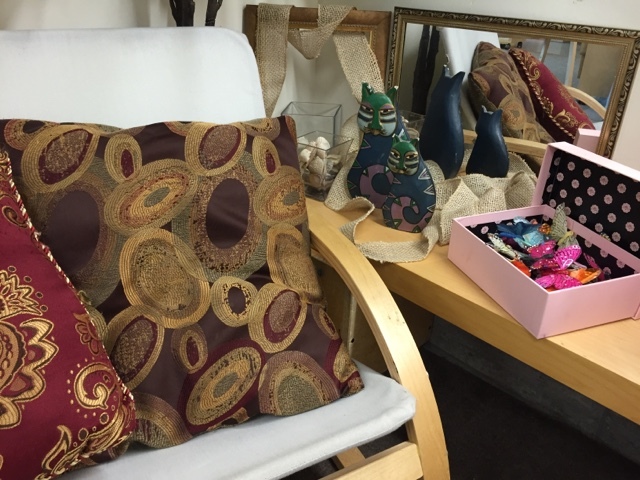 Our quiet reading corner has a collection of books and trinkets and treasures to explore. 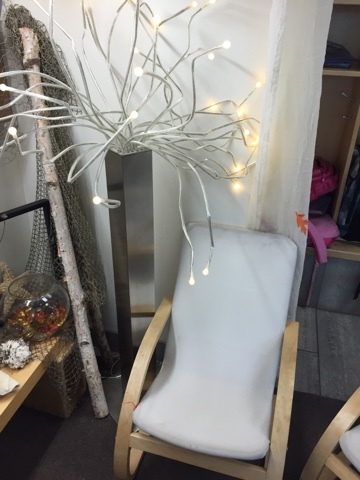 It's a comfortable area for children who want a quiet space to read or draw and the natural loose parts are a great way to calm oneself if a child is tired or needs a break. 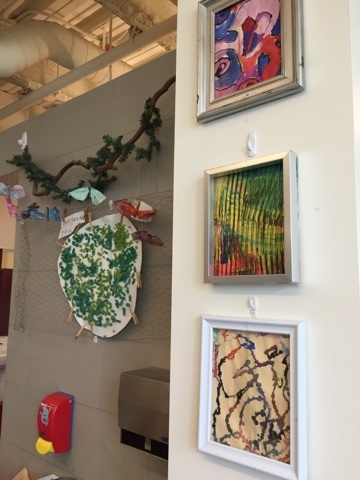 Currently oil pastel drawings of the children are on display (we love chicken wire for presenting art). 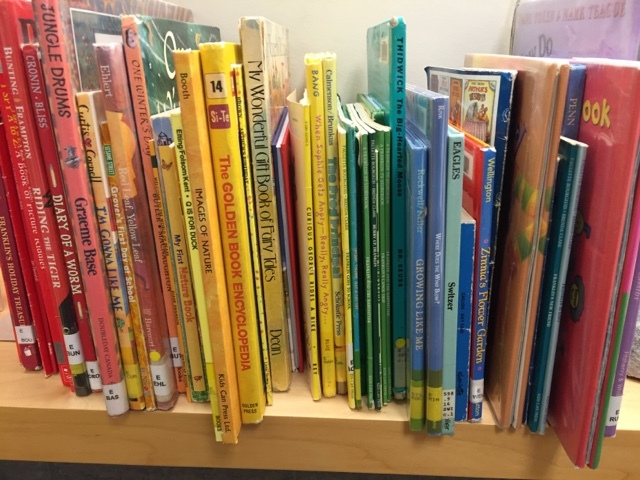 Math is embedded in the centre as books are organized and grouped by colour. It looks beautiful since our children love exploring the rainbow and also is an easy way to display the books. A shelf (made from an IKEA wall shelf propped on big blocks) keeps things low for the children to access when seated on the carpet. 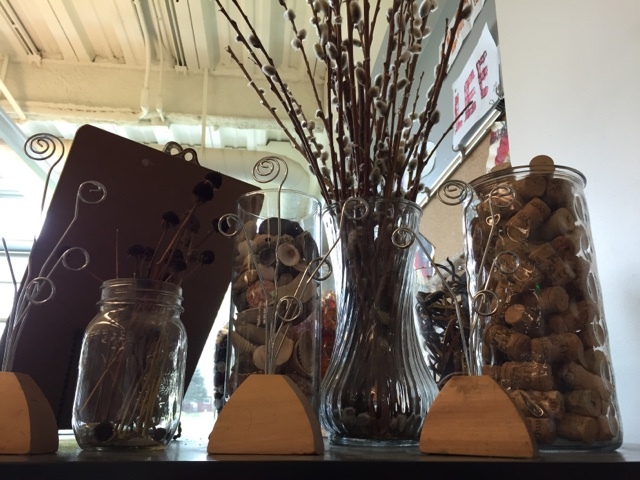 We have natural materials and many loose parts that are used as decor for the centre. Children can also access these and use them in their play. 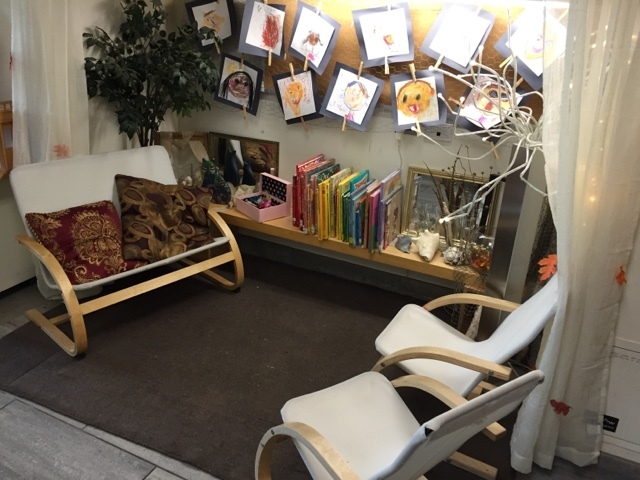 Child-sized chairs, comfy pillows and a whimsical light invite children to stay for a while and read a book or chat with a friend. Our families have been so generous in donating materials that they think might enhance our space. We try and use every inch of the room to reflect the stories of the children and engage and inspire. This is the back of an easel currently being used to display this fun frame. 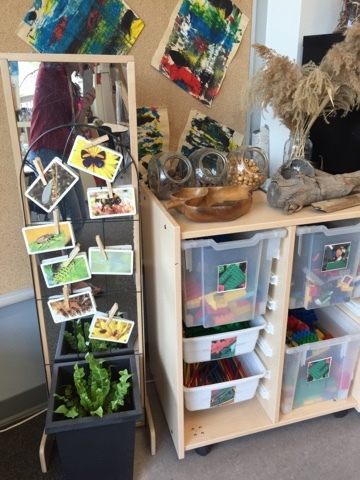 Our children love being outdoors and we want to advocate for the richness of the play that happens in our outdoor 'classroom' so we have many photos from outside around our room. We also like to engage children in collaborate art experiences. Earlier in the year we focused quite a bit on mindfulness and growth mindset. 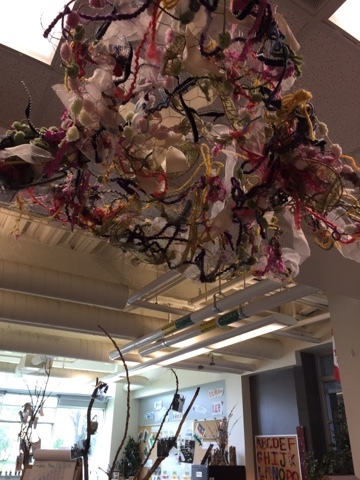 We read the book Extra Yarn and the children were eager to create a collaborative weaving piece using materials from the art studio and chicken wire. We have this on display near our cubbies. 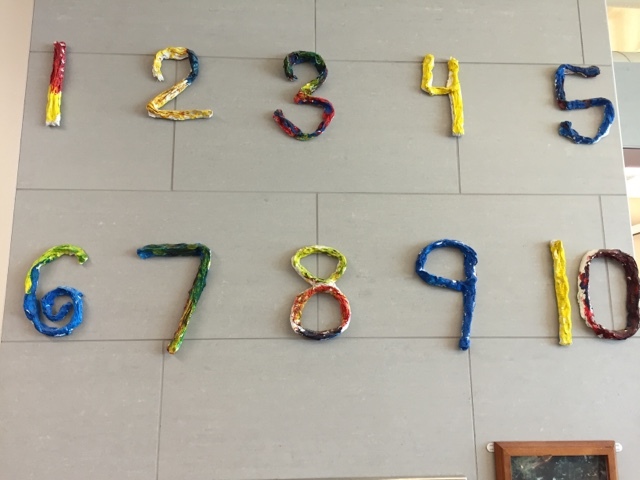 The children co-create displays in the classroom including the number line. 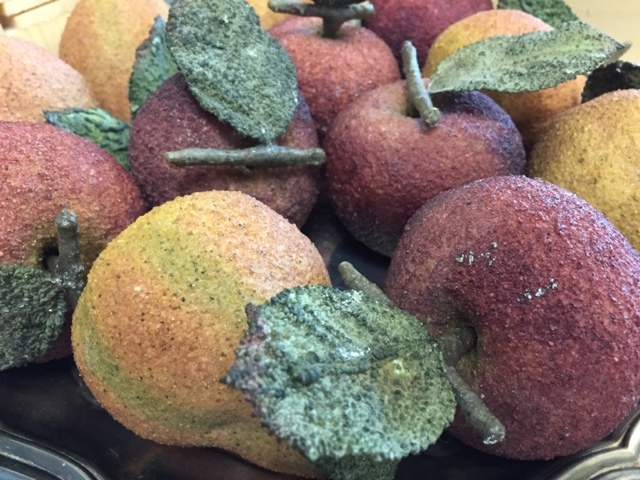 We used paper mache and paint to sculpt these with the children. 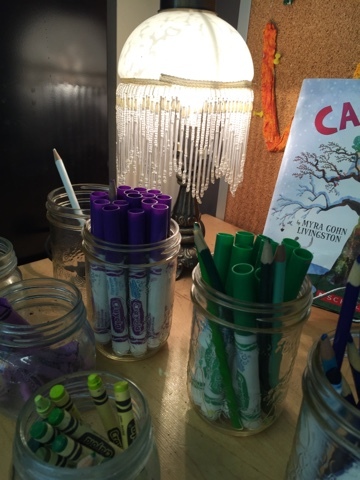 We believe it's more meaningful to have children create the reference and anchor materials in the room and do not use purchased or pre-made educational materials. Our math shelf has many things available for children. We include mentor texts, learning props, and documentation to showcase and support our program. 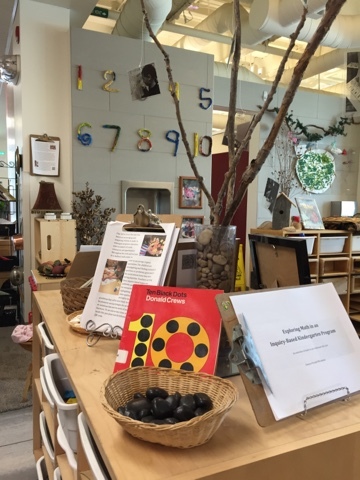 Professional books that have inspired me are interwoven throughout the displays as well as reflective pieces and documentation regarding how math works in our room. 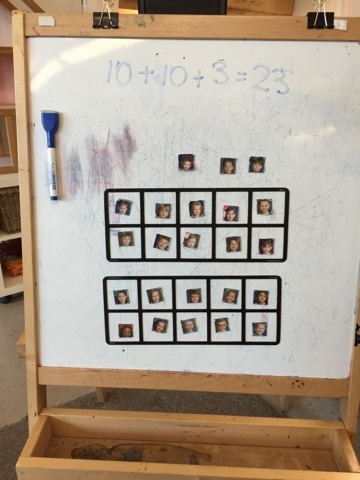 The children 'sign in' every day by putting their magnetic face on the ten frame. This provides a context for a daily number talk as the children share ways they have calculated the number of children at school for the day. At the beginning of the year children simply counted the magnets but as they've become more sophisticated in their math explorations, can now create complex equations and use strategies like skip counting and doubling to arrive at a total. Our drama centre changes based on the interests and requests of the children. Currently it is set up as a little 'house'. 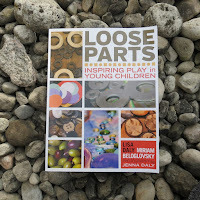 We include many real objects for the children to use in their imaginative play; real objects communicate the message to children that they are capable of using these tools and make the context for the imaginary play very real and meaningful. 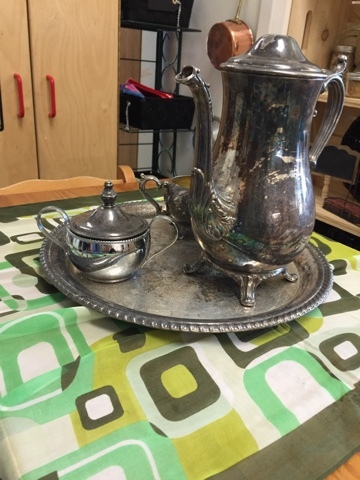 A silver tea set is a favourite for many! We use realistic representations of food instead of plastic products. 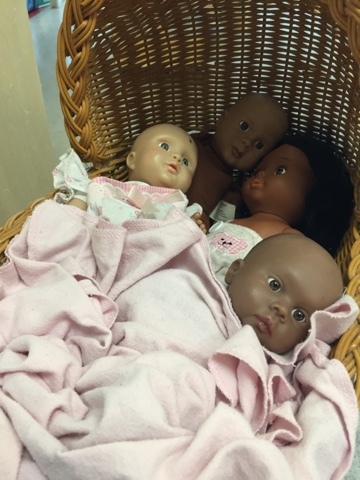 The babies sleep in a wicker bed. 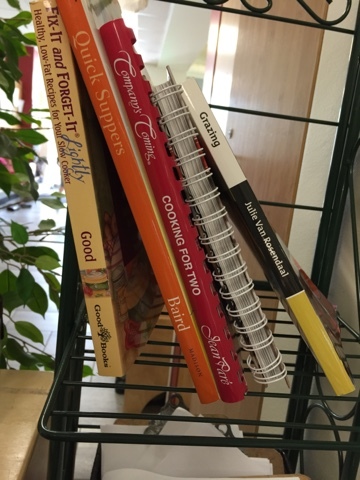 Literacy is interwoven throughout as children can talk on the phone, write on the chalk boards, or follow a recipe when cooking. Documentation hangs on the wall with a description of the centre and how it engages children. The QR code when scanned brings the user to all blog entries tagged 'dramatic arts' so they can see the history of the centre and learn the many stories of what has transpired in that area over our year. A cozy chair can be integrated into the play or used for children who want to snuggle up with a book or take a rest. 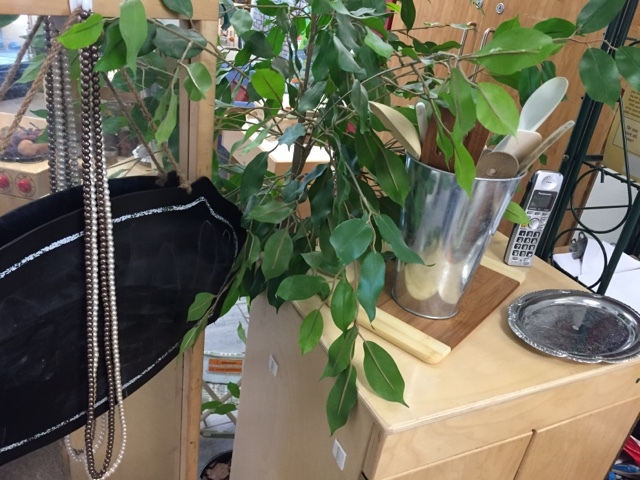 Natural treasures from our yard (and brought in by the children from their yards and neighbourhoods) adorn our space as both decor and inspiration for play. 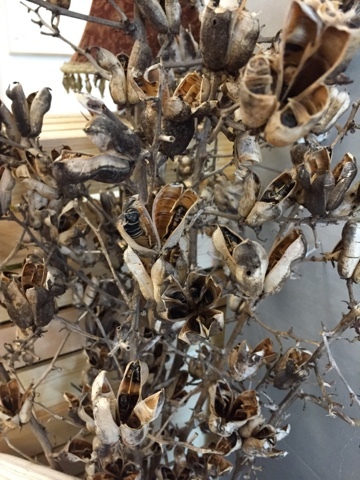 The children love to shake these dried flowers and hear the sounds the seeds inside the casings make. Our building area is the heart of our room and the most popular place to be. 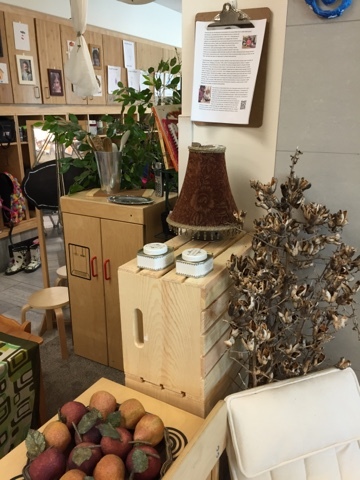 Children integrate materials from all around the classroom into their play here. We love the big body play the wooden blocks encourage. Art is celebrated and used as decor. Recycled frames are used to make the room cozy and celebrate the artwork. The tops of shelves showcase current interests the children have. Right now they are fascinated by birds and signs of spring. 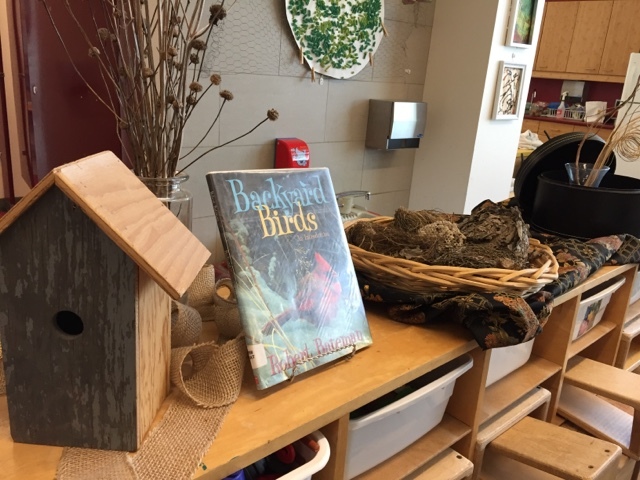 Nests and a birdhouse along with literacy materials related to birds are on display for the children's use and also as decor. 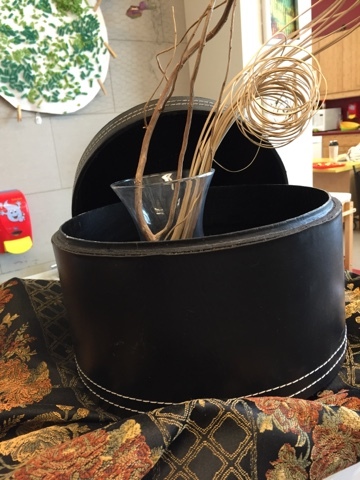 Unique things like this old hat box are also integrated into the space. More documentation about our philosophy for the importance of building is on display in the corresponding area. Our field trips support current inquiries and are an important part of the program. 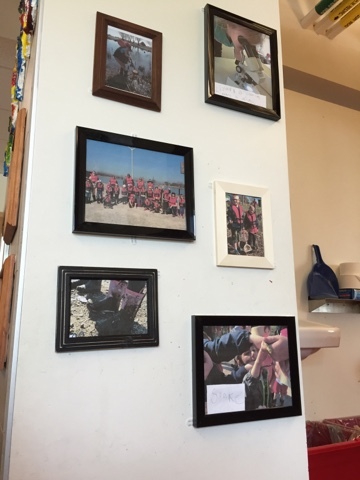 We have a wall dedicated to showcasing photos and documentation from our most recent trip together. Currently it's about our visit to Fighting Island. We are often asked by other educators about how we encourage the children to engage in regular reading and writing in a child-driven space. On the back of our bookshelf are writing clipboards, one per child. 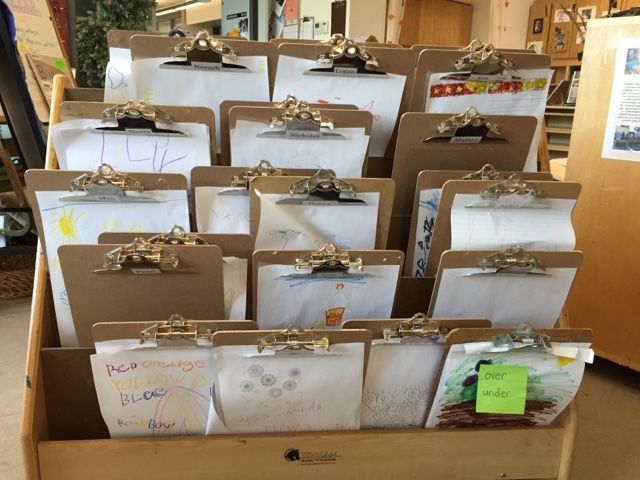 We ask children to self-select a piece of writing that they are proud of and display it on their clipboard. These are then brought to a sharing circle where children can discuss their work with others. It's a quick and easy way for us to see which children have (and haven't) engaged in regular writing so we know how to better support their needs. The children also have personal journals available in the writing area and next year we are hoping to introduce nature journals to be used as a regular part of our outdoor learning. This is our writing area. 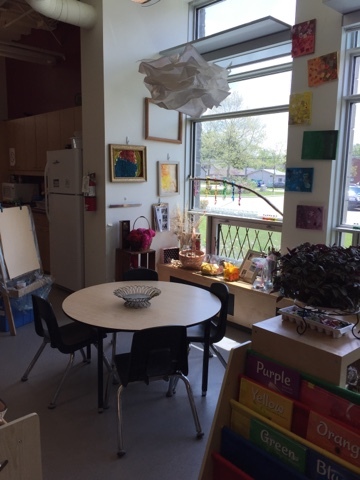 We like to have a beautiful, inspiring space for the children to use when they want to draw pictures or write with their friends. The children co-created this alphabet in the fall. 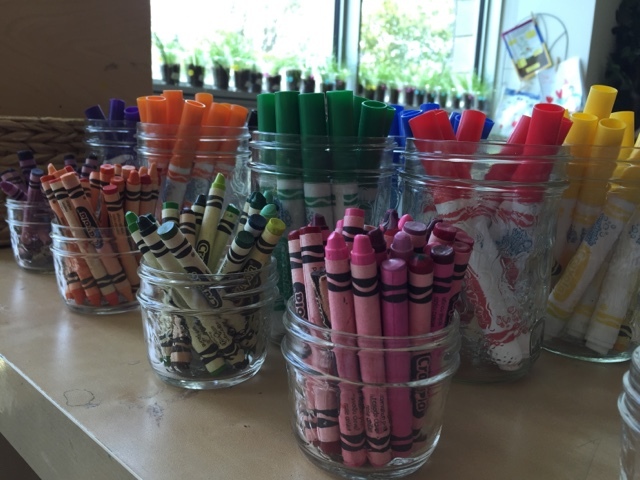 Math is integrated into the centre as children need to sort the drawing materials by colour. A quaint vintage lamp provides beauty and interest to the area. 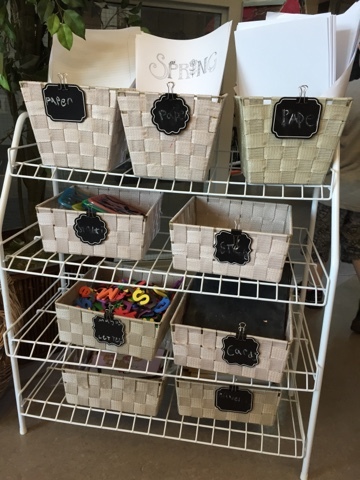 Materials are organized to keep things predictable and accessible and mini chalkboard tags label what goes in the baskets. Documentation (usually annotated photos and learning stories) are added to the documentation clipboard to show what has happened at the centre. A QR is also available here and users can scan it to see all the blog posts tagged literacy that have happened throughout the year. Because so much of what we do is captured digitally, the QR codes help us make this visible and accessible. The children are also knowledgeable on how the codes work and can also scan them with the class iPad if they'd like to reflect on past events. 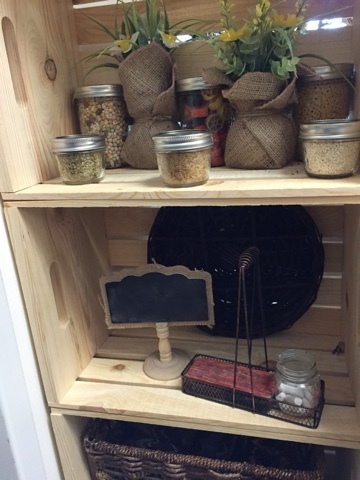 More natural materials are organized and displayed as decor and invitations for children's wonder. More documentation to showcase our learning outdoors throughout the year and how it relates to curriculum and ongoing inquiries is on display in the science area. We are fortunate to have a very large wall of windows on one side of the space and this is where we house our science and art areas. The view outdoors often inspires children as they observe nature and enjoy watching the birds at the feeder. 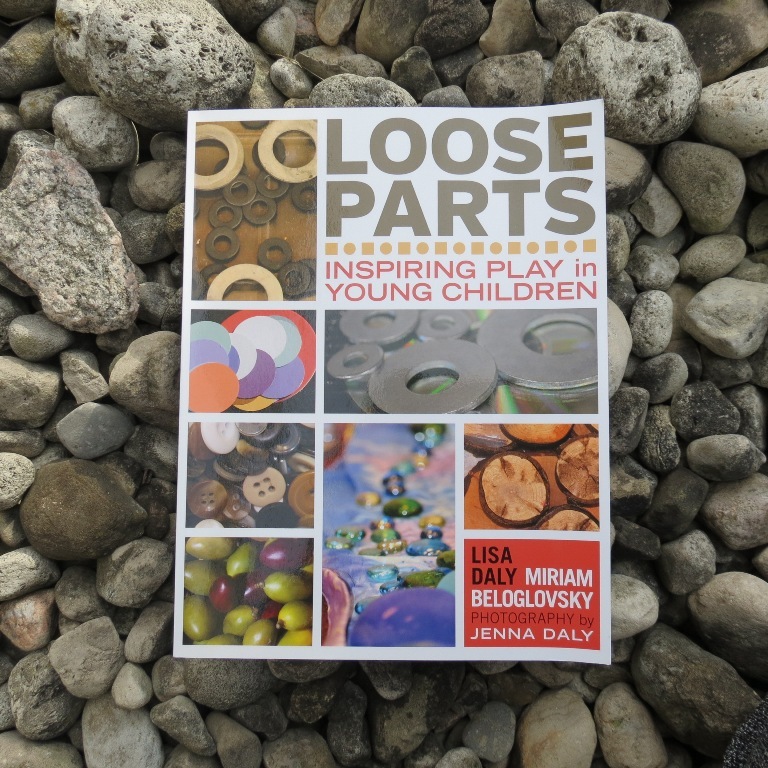 Loose parts play are a big part of our program as we embrace all things STEAM and love our makerspace. 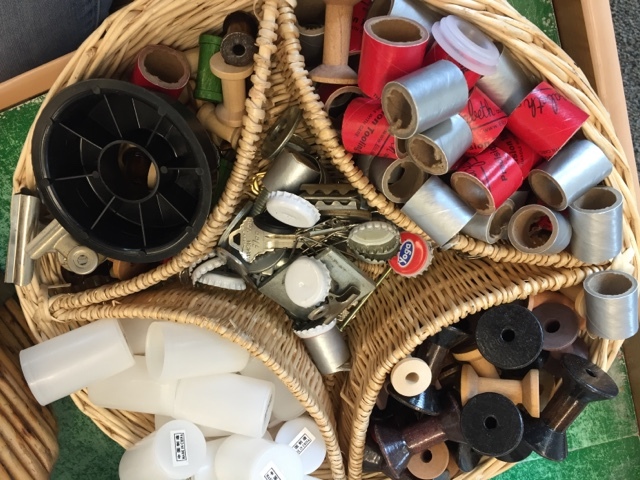 We use many natural and found materials here and always welcome donations from our families. 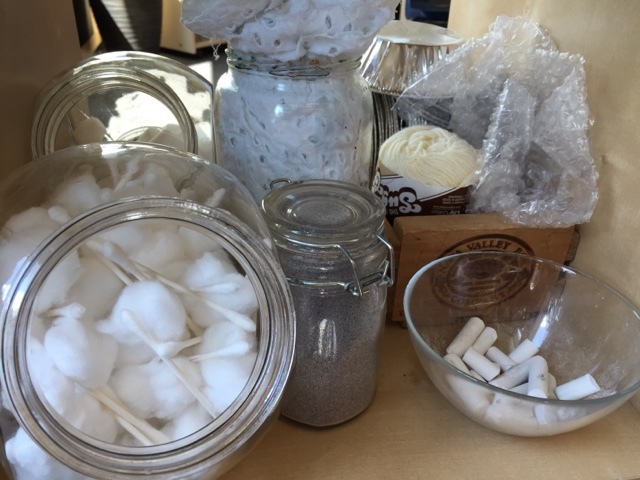 The science area also houses many building materials and the children can freely use these around the room in any area to support their play. We've attached a gardening trellis to a mirror so that photos of current interests (like insects) can help create a print-rich space. 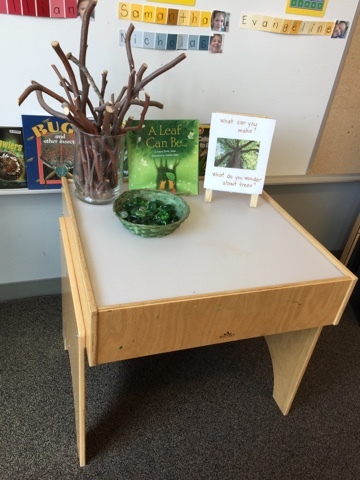 Our light table invites exploration, usually using loose parts. Currently the children are noticing the changes on the trees in our yard and have enjoyed playing under them. In this invitation we are encouraging the children to create and explore their ideas of what is important about trees. 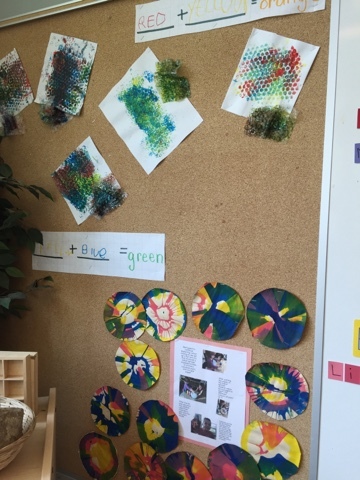 Children's explorations regarding colour mixing is currently on display as this was a very involved and ongoing interest this year. 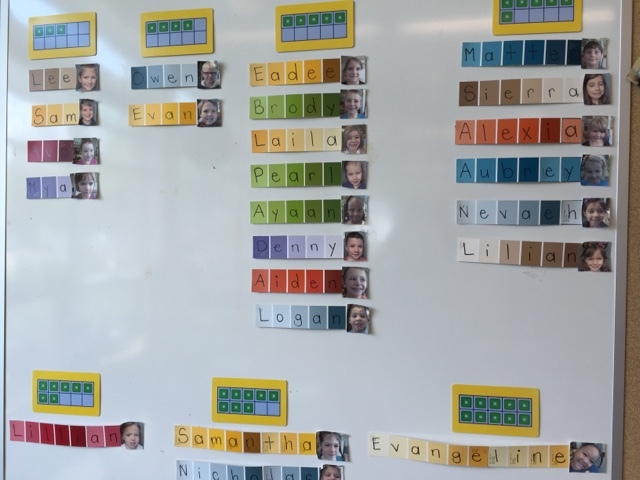 Our name wall is organized by the number of letters in a child's name to encourage math and subitizing. We have used paint chips as our name cards to show that colours have many shades. 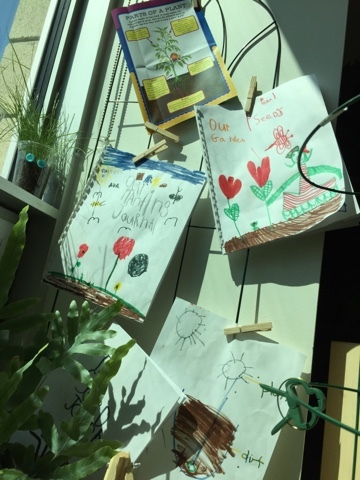 A current exploration is planting and our sunny window has many projects the children are currently working on including reading and writing about plants, growing many different kinds of seeds, tracking how fast the plants are growing, and journaling about these experiences. Invitations for further exploration are sometimes set up on the table in this area. Last week the children noticed holes in the trees in the yard so we are inviting them to do some research so they can figure out what caused the holes. 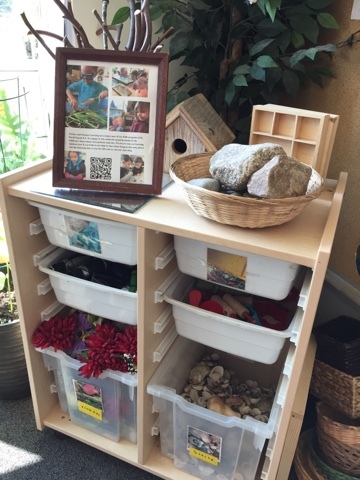 A sensory table integrates imaginative play regarding current interests, here insects and gardening. 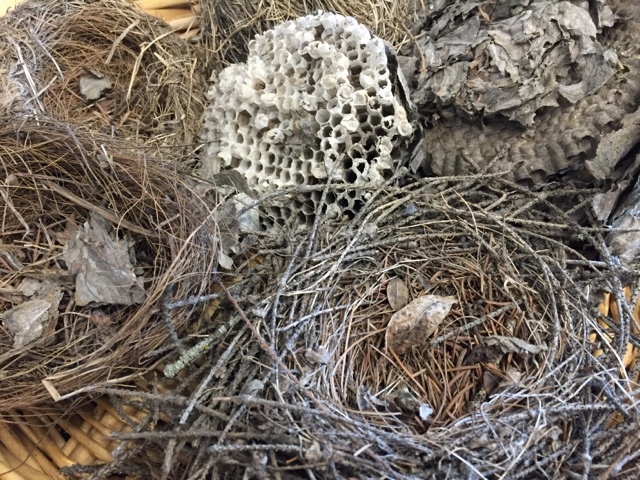 Natural wonders like this hive also decorate our space. 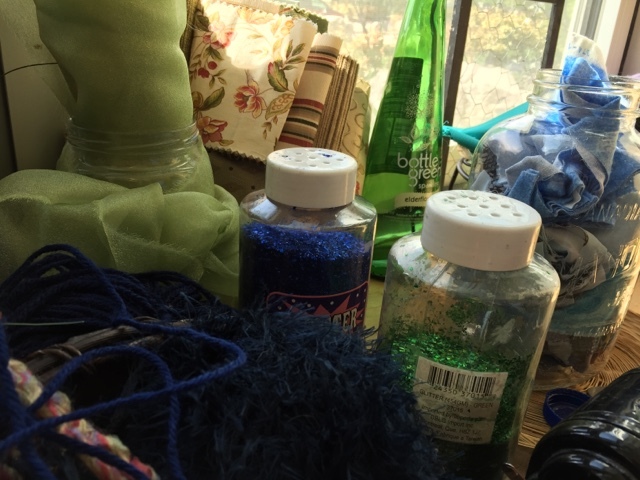 The art studio is located in a sunny window of the classroom. You can see that colours and colour mixing are ongoing interests and there is much art that supports this. The materials are aesthetically arranged to be accessible for children and also decorate the space. Materials are organized by colour for ease of accessibility and also to embed math and sorting into the centre. 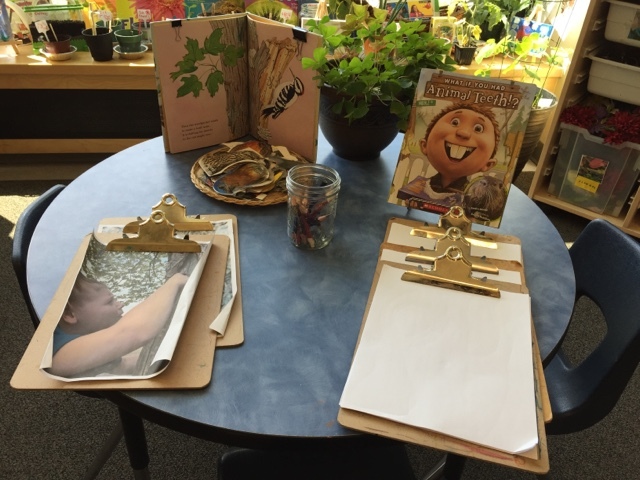 More documentation shares the stories of the learning in this area. 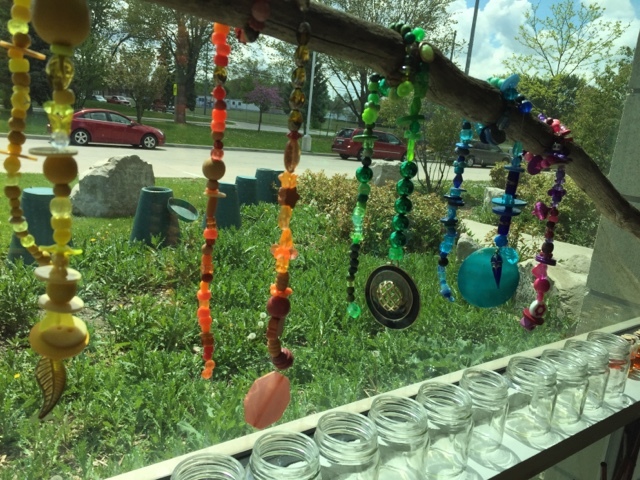 Our last communal project involved beading with recycled materials donated by our families. An interesting piece of art hangs over the space. Children can self-regulate and when they are hungry free flow independently into the snack centre during our big play blocks. 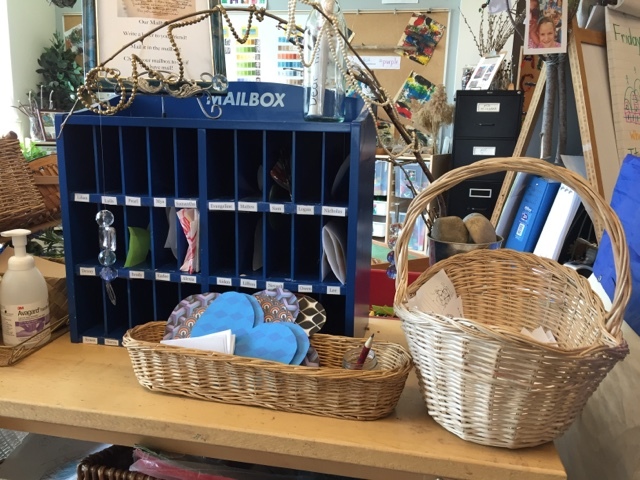 Literacy is encouraged here as children write and read letters written to one another and delivered in the mailbox. We have paper hearts so that the children can send thankful hearts to one another, celebrating acts of kindness. We also have an easel as visible in the previous photo that asks children a math question, usually a survey. Sometimes the educators write the question, other times the children do. 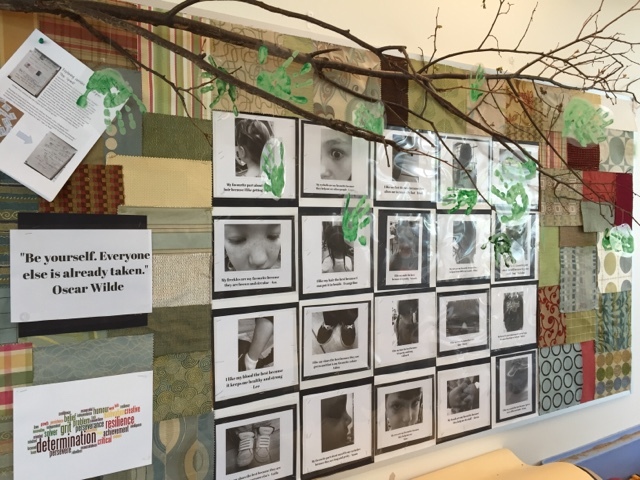 Throughout the year we have celebrated the individuality of children and how we can work together in a mindful space that supports growth mindset. This is documented in a large bulletin board near our snack centre. We have used recycled fabric squares as a background to represent the 'quilt' of student photos that celebrate each child and show how beautiful we are together as a group. Thank you for visiting us! We love feedback and to learn about your classroom and program. Please share in the comment section below or connect with us on Twitter @McLennan1977. Wow! This was an amazing read! Lots and lots of ideas to take away. Thanks for putting the time and effort and sharing this with the world it is much appreciated! Hudson that is a lovely compliment, thank you! That was my hope in crafting this post. 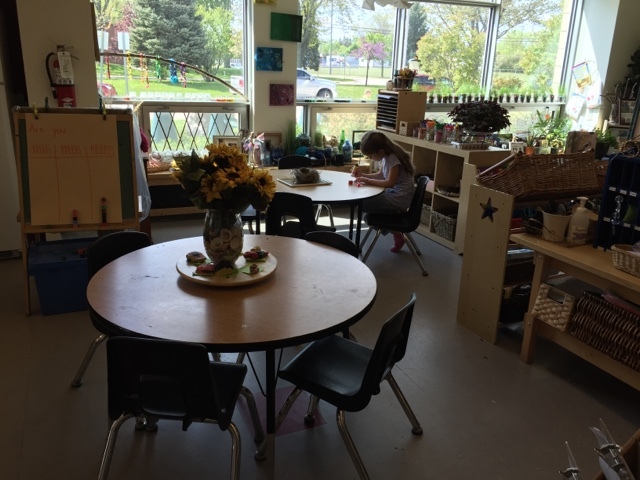 I wanted to share our learning space at this point in the year when it's at its peak, and also to give our families a window into their children's learning environment. I also hoped to share many practices that might inspire other educators, especially regarding math and literacy, as many of us begin to dream of our September start ups. Thank you Sasha! A great question that I am asked quite a bit. We co-create expectations and routines with the children and often bring problems back to our whole group discussions when they arise. One thing that we've noticed over the years is how careful the children are with the materials. Now, that's not to say we don't get broken objects. We do once in a while. 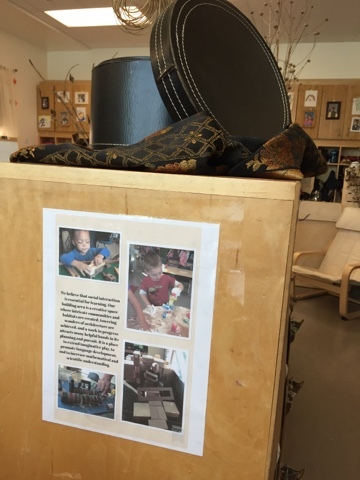 But I find that when children are recognized as capable participants in the room and their play is honoured with real life objects, they are very respectful of the space. We have maybe 2 or 3 things break a year and we have discussed with the children ahead of time what to do if something breaks. We are alerted by a child and the object is quickly swept up. It's not been an issue so far. Thanks for such a great question! Amazing space. When do you find the time to do the documentation? Does your school support this learning (meaning are you the only classroom like this)? Thank you! We have the support of our school and are following the expectations and approach to early learning as outlined in Ontario's curriculum. 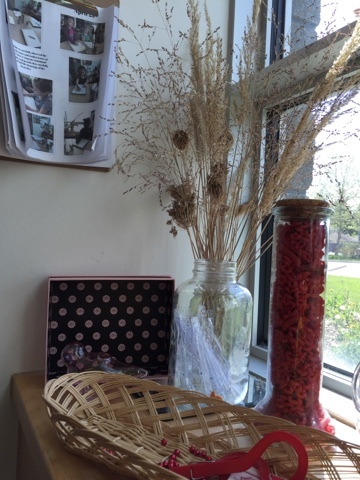 I find that I am constantly documenting; together with the children, on my lunches and preps, calling children to document with me while my teaching partner is leading another activity, at home, etc. I use a phone or ipad to do so and rely on apps like Blogger, Twitter, Pic Collage, Instagram, etc. so it's all available on the device. I'm pretty comfortable with technology so I try to get the most from my efforts. I'm thinking of doing a blog post specifically on documentation because there has been so much interest in it as a result of this post. 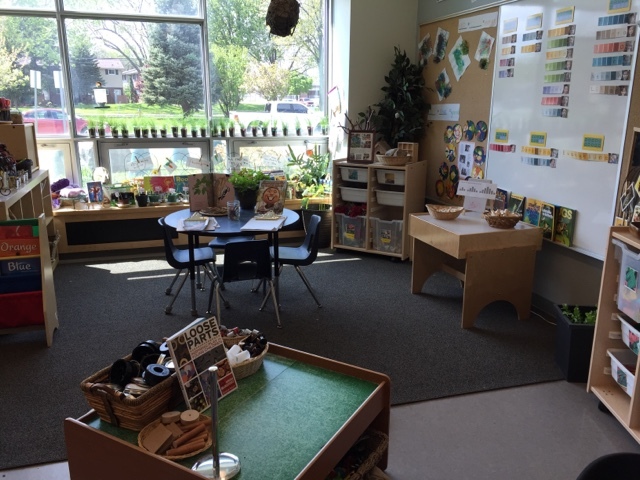 Thanks for sharing your classroom! I was wondering how you made the paper mache letters and numbers. Thanks for the link to the blog post! I am going to do the letters and numbers with my students in the fall. I saw a couple of other things in this post I would like to do next year. Thanks again for sharing! This is perfection. It's everything I want my early years classroom to be. I've saved your post to watch and read again. There's so much to see. Thank you for taking time to share it. What a kind compliment from such an experience early years educator! Thank you so very much! I love this setting. I all in the final stages of teacher training and will be working with 5-6 years olds. I think this is an inspiring way for children to learn. I will be sharing it with colleagues too. Thank you. Thank you Tasha! What an exciting time for you as you finish your education and begin to dream of the space of possibility for your classroom! We have four tables with enough seats for 23 children. 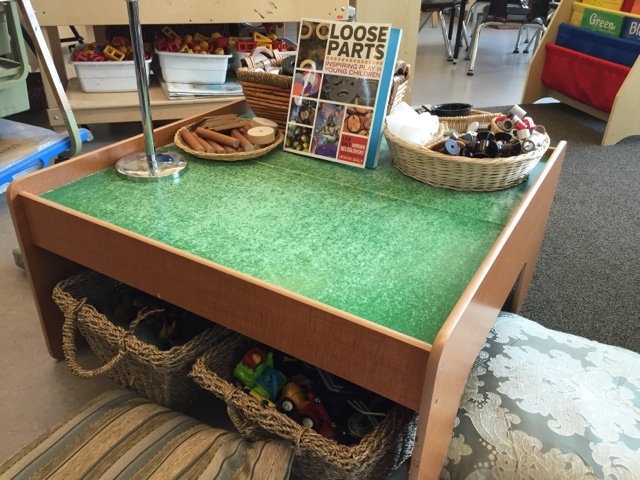 These tables are used at centres during the playtime and then cleared of materials for the whole group lunch. I'd love to somehow rework the schedule so lunch is also free flow at the snack centre and the remaining tables don't need to be cleared. So far this has been challenging to think about in our day and is on the list of 'to dos' for the future. Beautiful! I love all the resources you have! Thank you for sharing and welcoming us into your world...I have gained lots of ideas for September! So happy to hear that Shannon! Thank you kindly! It's always fun to think of new things for the room. We also are already planning to evolve some of the spaces to better meet our needs for September. 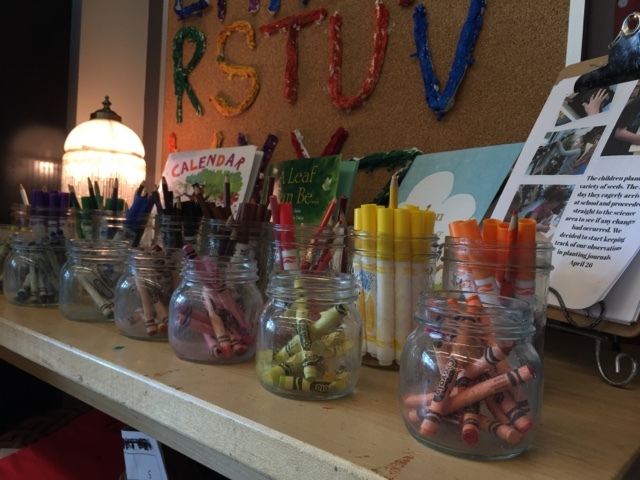 Love, love love this Reggio/Emergent approach! Thank you so much for sharing. I am sharing with my teaching colleagues and principal. So am I to understand that you do not have set lunch times? Curious how this works for you. Or if I am wrong, where does everyone sit for lunch. I find using the tables in our classroom for 31 kids to eat lunch at and then cleaning up from that to put activities out to be one of our biggest challenges. We have free flow snack where children can visit the snack centre whenever they want during the large play blocks. For lunch they do all sit at the tables together but I'm hoping to change this at some point. 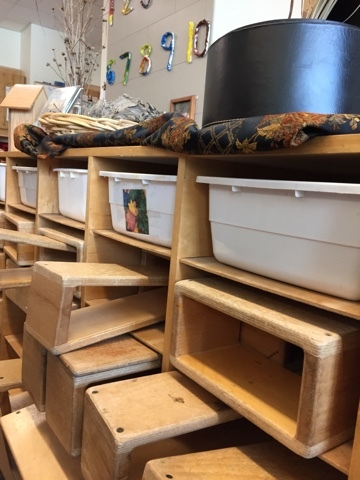 Moving the materials is a hassle, I agree, and even though the children help us with this I would rather not move the invitations and documentation at each unless I have to. 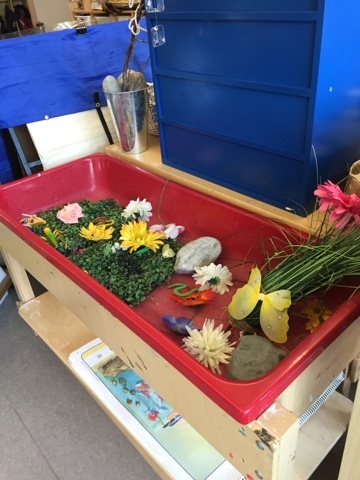 Beautiful setting, where lots of thought has been given to it, though I actually wonder how the children respect the spaces, personally the children in my setting would trash the beautiful displays and move objects for one area to another. Is there any way to encourage a degree of respect. Our children have been very respectful of the space - we have a lovely group! We do a LOT of discussing, modelling, and then problem solving as a group when things get broken. This does happen. 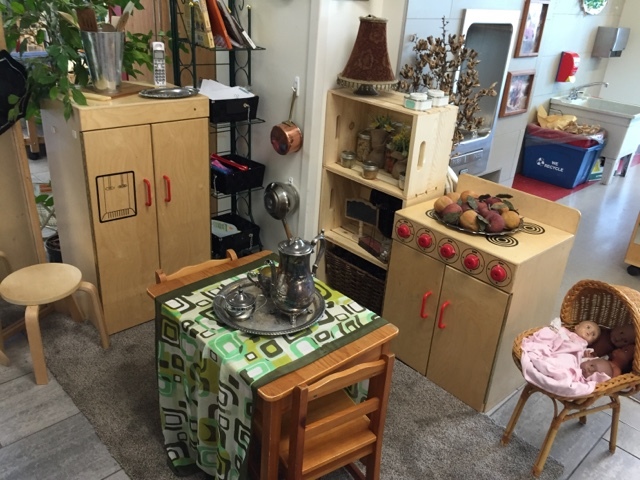 We encourage the children to move things around the room as needed. At the end of our playtime our 'star of the day' does a centre check to see if things have been cleaned and organized adequately. If not, then the star calls volunteers over to reclean and reorganize until we feel it's done properly. I am delighted to have found your blog and I am very grateful you took the time to share your classroom. It is beautiful, and I would love to learn there. You seem to have really made it the student's space, while also making it attractive and inviting. Thanks for the inspiration. 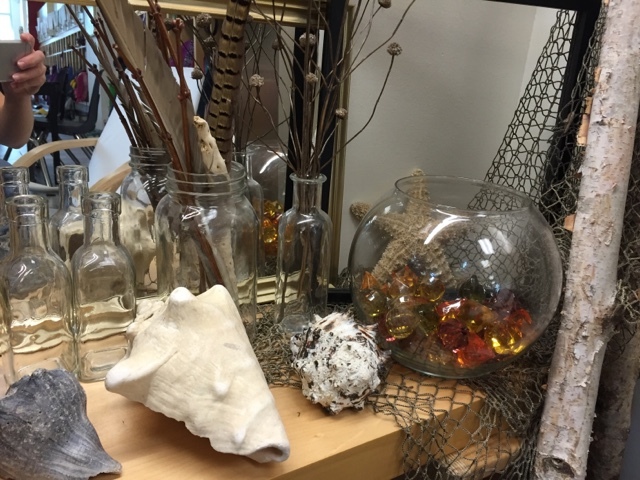 Thank you for sharing your photos and descriptions of your classroom. 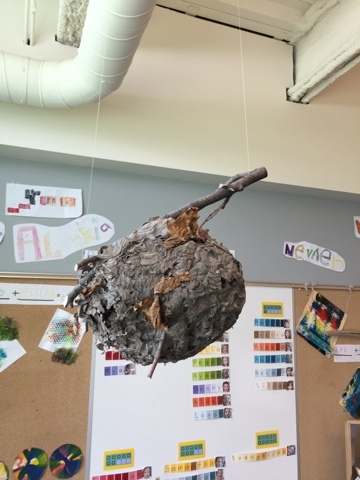 I have been teaching preschool and kindergarten for over 30 years, but next school year will be my first time setting up and teaching in a Reggio-Inspired setting. I will borrow many of your ideas. You have given me a jumpstart on creating a beautiful learning space for my students.